A movie star for your ownership! 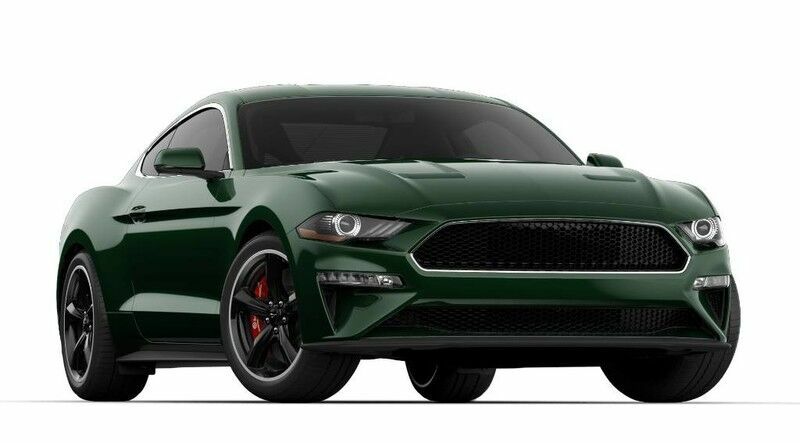 Meet our 2019 Ford Mustang BULLITT Coupe that's got plenty of swagger in Dark Highland Green! Feel the power from the 5.0 Litre V8 as it offers 480hp while paired with a fun-to-drive 6 Speed Manual transmission with launch control as well as Electronic Line-Lock. Our BULLITT is amazingly agile and responsive as it sprints to 60mph in just 4.7 seconds while scoring near 9.4L/100km. You will love the deep rumble that adds to the timeless good looks of our BULLITT with its iconic curves that ignite a sense of adventure. Take note of the beautiful alloy wheels, raised blade decklid spoiler, LED fog lights, and HID headlamps with signature lighting. Open the door and settle into the BULLITT style low, sporty seats as you enjoy a wealth of thoughtful features including a 50/50 split folding rear seat, aluminum-trimmed dashboard, chrome-accented 4-gauge instrument cluster, Intelligent Access with push-button start and even Track Apps performance telemetry! Maintain a seamless connection thanks to the Sync voice-controlled interface with a central screen, Bluetooth, and an impressive sound system with a CD player and dual USB ports. Not only does our Ford Mustang treat you to exceptional driving pleasure, it also provides priceless peace of mind. You'll be well-equipped with a rearview camera, advanced airbags, a tire pressure monitoring system, and MyKey parental controls. Rekindle your love of driving with this incredible machine! Print this page and call us Now... We Know You Will Enjoy Your Test Drive Towards Ownership! Blackstock is proud to be a premier Ford and Lincoln dealership in the Orangeville, Ontario area. From the moment you walk into our showroom, you'll know our commitment to customer service is second to none. Whether you need to purchase, finance, or service a new or pre-owned Ford or Lincoln, you've come to the right place. Built for the road! Our 2019 Ford Mustang EcoBoost Fastback is irresistible in Ruby Red! Feel the TurboCharged 2.3 Litre EcoBoost 4 Cylinder offering 310hp while connected to a 6 Speed Manual transmission for amazing road feel. Our Mustang is agile and delivers a crisp and responsive driving experience along with near 7.8L/100km on the highway. Check out the timeless good looks of our Fastback with its iconic curves that ignite a sense of adventure. Take note of the beautiful alloy wheels, LED fog lights, and HID headlamps with signature lighting. Open the door and settle into the low, sporty driver's seat in our Ecoboost Fastback and you will enjoy a wealth of thoughtful features including Selectable-Effort electric power-assist steering, a 50/50 split folding rear seat, aluminum-trimmed dashboard, chrome-accented 4-gauge instrument cluster, Intelligent Access with push-button start and even Track Apps performance telemetry! Maintain a seamless connection thanks to the Sync voice-controlled interface with a central screen, Bluetooth, and an impressive sound system with a CD player and dual USB ports. Not only does our Ford Mustang treat you to exceptional driving pleasure, it also provides priceless peace of mind. You'll be well-equipped with a rear camera, advanced airbags, a tire pressure monitoring system, and MyKey parental controls. It's time to reward yourself with driving fun that is synonymous with the galloping pony! Print this page and call us Now... We Know You Will Enjoy Your Test Drive Towards Ownership! Blackstock is proud to be a premier Ford and Lincoln dealership in the Orangeville, Ontario area. From the moment you walk into our showroom, you'll know our commitment to customer service is second to none. Whether you need to purchase, finance, or service a new or pre-owned Ford or Lincoln, you've come to the right place. Turn heads in our 2019 Ford Mustang GT Fastback that's got plenty of swagger in Race Red! Powered by a Coyote 5.0 Litre V8 offering 460hp while paired with a fun-to-drive 6 Speed Manual transmission with launch control as well as Electronic Line-Lock. Our GT is amazingly agile and responsive as it sprints to 60mph in just 4.7 seconds while scoring near 9.4L/100km. Enjoy a deep rumble that adds to the timeless good looks of our GT Fastback with its iconic curves that ignite a sense of adventure. Take note of the beautiful alloy wheels, raised blade decklid spoiler, LED fog lights, and HID headlamps with signature lighting. Open the door to this GT and settle into the low, sporty driver's seat. You'll enjoy a wealth of thoughtful features including a 50/50 split folding rear seat, aluminum-trimmed dashboard, chrome-accented 4-gauge instrument cluster, Intelligent Access with push-button start and even Track Apps performance telemetry! Maintain a seamless connection thanks to the Sync voice-controlled interface with a central screen, Bluetooth, and an impressive sound system with a CD player and dual USB ports. Not only does our Ford Mustang treat you to exceptional driving pleasure, it also provides priceless peace of mind. You'll be well-equipped with a rearview camera, advanced airbags, a tire pressure monitoring system, and MyKey parental controls. Rekindle your love of driving with this incredible machine! Print this page and call us Now... We Know You Will Enjoy Your Test Drive Towards Ownership! Blackstock is proud to be a premier Ford and Lincoln dealership in the Orangeville, Ontario area. From the moment you walk into our showroom, you'll know our commitment to customer service is second to none. Whether you need to purchase, finance, or service a new or pre-owned Ford or Lincoln, you've come to the right place. Turn heads in our 2019 Ford Mustang GT Fastback that's got plenty of swagger in Oxford White! Powered by a Coyote 5.0 Litre V8 offering 460hp while paired with a fun-to-drive 6 Speed Manual transmission with launch control as well as Electronic Line-Lock. Our GT is amazingly agile and responsive as it sprints to 60mph in just 4.7 seconds while scoring near 9.4L/100km. Enjoy a deep rumble that adds to the timeless good looks of our GT Fastback with its iconic curves that ignite a sense of adventure. Take note of the beautiful alloy wheels, raised blade decklid spoiler, LED fog lights, and HID headlamps with signature lighting. Open the door to this GT and settle into the low, sporty driver's seat. You'll enjoy a wealth of thoughtful features including a 50/50 split folding rear seat, aluminum-trimmed dashboard, chrome-accented 4-gauge instrument cluster, Intelligent Access with push-button start and even Track Apps performance telemetry! Maintain a seamless connection thanks to the Sync voice-controlled interface with a central screen, Bluetooth, and an impressive sound system with a CD player and dual USB ports. Not only does our Ford Mustang treat you to exceptional driving pleasure, it also provides priceless peace of mind. You'll be well-equipped with a rearview camera, advanced airbags, a tire pressure monitoring system, and MyKey parental controls. Rekindle your love of driving with this incredible machine! Print this page and call us Now... We Know You Will Enjoy Your Test Drive Towards Ownership! Blackstock is proud to be a premier Ford and Lincoln dealership in the Orangeville, Ontario area. From the moment you walk into our showroom, you'll know our commitment to customer service is second to none. Whether you need to purchase, finance, or service a new or pre-owned Ford or Lincoln, you've come to the right place. This outstanding example of a 2019 Ford Mustang GT is offered by Blackstock Ford Lincoln. There's a level of quality and refinement in this Ford Mustang that you won't find in your average vehicle. Just what you've been looking for. With quality in mind, this vehicle is the perfect addition to take home. The Ford Mustang GT will provide you with everything you have always wanted in a car -- Quality, Reliability, and Character. This is about the time when you're saying it is too good to be true, and let us be the one's to tell you, it is absolutely true. Contact Blackstock Ford Lincoln today for information on dozens of vehicles like this 2019 Ford Mustang GT. You appreciate the finer things in life, the vehicle you drive should not be the exception. Style, performance, sophistication is in a class of its own with this stunning Ford Mustang. You've found the one you've been looking for. Your dream car. This is the one. Just what you've been looking for. Just what you've been looking for. With quality in mind, this vehicle is the perfect addition to take home. Turn heads in our 2019 Ford Mustang GT Fastback that's got plenty of swagger in Velocity Blue! Powered by a Coyote 5.0 Litre V8 offering 460hp while paired with a fun-to-drive 10-Speed automatic with launch control as well as Electronic Line-Lock. Our GT is amazingly agile and responsive as it sprints to 60mph in just 4.7 seconds while scoring near 9.4L/100km. Enjoy a deep rumble that adds to the timeless good looks of our GT Fastback with its iconic curves that ignite a sense of adventure. Take note of the beautiful alloy wheels, raised blade decklid spoiler, LED fog lights, and HID headlamps with signature lighting. Open the door to this GT and settle into the low, sporty driver's seat. You'll enjoy a wealth of thoughtful features including a 50/50 split folding rear seat, aluminum-trimmed dashboard, chrome-accented 4-gauge instrument cluster, Intelligent Access with push-button start and even Track Apps performance telemetry! Maintain a seamless connection thanks to the Sync voice-controlled interface with a central screen, Bluetooth, and an impressive sound system with a CD player and dual USB ports. Not only does our Ford Mustang treat you to exceptional driving pleasure, it also provides priceless peace of mind. You'll be well-equipped with a rearview camera, advanced airbags, a tire pressure monitoring system, and MyKey parental controls. Rekindle your love of driving with this incredible machine! Print this page and call us Now... We Know You Will Enjoy Your Test Drive Towards Ownership! Blackstock is proud to be a premier Ford and Lincoln dealership in the Orangeville, Ontario area. From the moment you walk into our showroom, you'll know our commitment to customer service is second to none. Whether you need to purchase, finance, or service a new or pre-owned Ford or Lincoln, you've come to the right place. Turn heads in our 2019 Ford Mustang GT Fastback that's got plenty of swagger in Velocity Blue! Powered by a Coyote 5.0 Litre V8 offering 460hp while paired with a fun-to-drive 6 Speed Manual transmission with launch control as well as Electronic Line-Lock. Our GT is amazingly agile and responsive as it sprints to 60mph in just 4.7 seconds while scoring near 9.4L/100km. Enjoy a deep rumble that adds to the timeless good looks of our GT Fastback with its iconic curves that ignite a sense of adventure. Take note of the beautiful alloy wheels, raised blade decklid spoiler, LED fog lights, and HID headlamps with signature lighting. Open the door to this GT and settle into the low, sporty driver's seat. You'll enjoy a wealth of thoughtful features including a 50/50 split folding rear seat, aluminum-trimmed dashboard, chrome-accented 4-gauge instrument cluster, Intelligent Access with push-button start and even Track Apps performance telemetry! Maintain a seamless connection thanks to the Sync voice-controlled interface with a central screen, Bluetooth, and an impressive sound system with a CD player and dual USB ports. Not only does our Ford Mustang treat you to exceptional driving pleasure, it also provides priceless peace of mind. You'll be well-equipped with a rearview camera, advanced airbags, a tire pressure monitoring system, and MyKey parental controls. Rekindle your love of driving with this incredible machine! Print this page and call us Now... We Know You Will Enjoy Your Test Drive Towards Ownership! Blackstock is proud to be a premier Ford and Lincoln dealership in the Orangeville, Ontario area. From the moment you walk into our showroom, you'll know our commitment to customer service is second to none. Whether you need to purchase, finance, or service a new or pre-owned Ford or Lincoln, you've come to the right place. Turn heads in our 2019 Ford Mustang GT Fastback that's got plenty of swagger in Magnetic! Powered by a Coyote 5.0 Litre V8 offering 460hp while paired with a fun-to-drive 6 Speed Manual transmission with launch control as well as Electronic Line-Lock. Our GT is amazingly agile and responsive as it sprints to 60mph in just 4.7 seconds while scoring near 9.4L/100km. Enjoy a deep rumble that adds to the timeless good looks of our GT Fastback with its iconic curves that ignite a sense of adventure. Take note of the beautiful alloy wheels, raised blade decklid spoiler, LED fog lights, and HID headlamps with signature lighting. Open the door to this GT and settle into the low, sporty driver's seat. You'll enjoy a wealth of thoughtful features including a 50/50 split folding rear seat, aluminum-trimmed dashboard, chrome-accented 4-gauge instrument cluster, Intelligent Access with push-button start and even Track Apps performance telemetry! Maintain a seamless connection thanks to the Sync voice-controlled interface with a central screen, Bluetooth, and an impressive sound system with a CD player and dual USB ports. Not only does our Ford Mustang treat you to exceptional driving pleasure, it also provides priceless peace of mind. You'll be well-equipped with a rearview camera, advanced airbags, a tire pressure monitoring system, and MyKey parental controls. Rekindle your love of driving with this incredible machine! Print this page and call us Now... We Know You Will Enjoy Your Test Drive Towards Ownership! Blackstock is proud to be a premier Ford and Lincoln dealership in the Orangeville, Ontario area. From the moment you walk into our showroom, you'll know our commitment to customer service is second to none. Whether you need to purchase, finance, or service a new or pre-owned Ford or Lincoln, you've come to the right place. EXCLUSIVE BONUS ON ANY PP2 PURCHASED FROM BLACKSTOCK BUY A SET OF STREET TIRES (FOR YOUR PP2 STANG) UNDER OUR LOWEST TIRE PRICE GUARANTEE AND GET THE FOLLOWING FREE! 3 YEARS OF NO CHARGE REMOVAL & MOUNT AND BALANCE OF YOU TRACK OR STREET TIRES 2 TIMES PER YEAR! STATE OF THE ART EQUIPMENT AND 3M WEIGHT TAPE HUNTER DIGITAL BALANCING INCLUDED TWO LOCATIONS - BLACKSTOCK FORD OR QUICK LANE ORANGEVILLE Rare! Performance Pack Level 2 $6,500 Included! The Performance Pack Level 2 is not only the best performing Mustang GT ever, it offers unbeatable value. Incredibly, it also sells for the exact same $6500 in US dollars AND Canadian Dollars. Considering the Performance Pack 1 is $4,200 and Magneride is $2,500, then the PP2 including Magneride is clearly the way to go. Look at the value in detail: 19-inch x 10.5-inch (F) / 19-inch x 11-inch (R) Dark Tarnish Stainless-painted Aluminum Wheels 305/30/R19 Michelin Pilot Sport Cup 2 Tires (Summer Only) Brembo Six Piston Front Brake Calipers with Larger Rotors Engine Spun Aluminum Instrument Panel Gauge Pack (Vacuum and Oil Pressure) High Performance Front Splitter K-Brace Large Radiator MagneRide Damping System with Track Inspired Calibration Strut Tower Brace TORSEN Differential with 3.73 Axle Ratio Unique Rear Spoiler Unique Track-inspired Chassis, Stability Control, EPAS, and ABS Tuning Unique Track-inspired Springs and Sway Bar Active Exhaust $995 Included Another incredible value option from Ford. The 4 settings, Quiet, Normal, Sport Plus and Track can either be pre-selected in the dash or automatically chosen with the Drive Mode Toggle. Plus, Active Exhaust has a Quiet Start Mode your neighbours will appreciate. Pre-Set a timer to always start in Quiet Mode. Turn heads in our 2019 Ford Mustang GT Fastback that's got plenty of swagger in Shadow Black! Powered by a Coyote 5.0 Litre V8 offering 460hp while paired with a fun-to-drive 6 Speed Manual transmission with launch control as well as Electronic Line-Lock. Our GT is amazingly agile and responsive as it sprints to 60mph in just 4.7 seconds while scoring near 9.4L/100km. Enjoy a deep rumble that adds to the timeless good looks of our GT Fastback with its iconic curves that ignite a sense of adventure. Take note of the beautiful alloy wheels, raised blade decklid spoiler, LED fog lights, and HID headlamps with signature lighting. Open the door to this GT and settle into the low, sporty driver's seat. You'll enjoy a wealth of thoughtful features including a 50/50 split folding rear seat, aluminum-trimmed dashboard, chrome-accented 4-gauge instrument cluster, Intelligent Access with push-button start and even Track Apps performance telemetry! Maintain a seamless connection thanks to the Sync voice-controlled interface with a central screen, Bluetooth, and an impressive sound system with a CD player and dual USB ports. Not only does our Ford Mustang treat you to exceptional driving pleasure, it also provides priceless peace of mind. You'll be well-equipped with a rearview camera, advanced airbags, a tire pressure monitoring system, and MyKey parental controls. Rekindle your love of driving with this incredible machine! Print this page and call us Now... We Know You Will Enjoy Your Test Drive Towards Ownership! Blackstock is proud to be a premier Ford and Lincoln dealership in the Orangeville, Ontario area. From the moment you walk into our showroom, you'll know our commitment to customer service is second to none. Whether you need to purchase, finance, or service a new or pre-owned Ford or Lincoln, you've come to the right place. EXCLUSIVE BONUS ON ANY PP2 PURCHASED FROM BLACKSTOCK BUY A SET OF STREET TIRES (FOR YOUR PP2 STANG) UNDER OUR LOWEST TIRE PRICE GUARANTEE AND GET THE FOLLOWING FREE! 3 YEARS OF NO CHARGE REMOVAL & MOUNT AND BALANCE OF YOU TRACK OR STREET TIRES 2 TIMES PER YEAR! STATE OF THE ART EQUIPMENT AND 3M WEIGHT TAPE HUNTER DIGITAL BALANCING INCLUDED TWO LOCATIONS - BLACKSTOCK FORD OR QUICK LANE ORANGEVILLE Rare! Performance Pack Level 2 $6,500 Included! The Performance Pack Level 2 is not only the best performing Mustang GT ever, it offers unbeatable value. Incredibly, it also sells for the exact same $6500 in US dollars AND Canadian Dollars. Considering the Performance Pack 1 is $4,200 and Magneride is $2,500, then the PP2 including Magneride is clearly the way to go. Look at the value in detail: 19-inch x 10.5-inch (F) / 19-inch x 11-inch (R) Dark Tarnish Stainless-painted Aluminum Wheels 305/30/R19 Michelin Pilot Sport Cup 2 Tires (Summer Only) Brembo Six Piston Front Brake Calipers with Larger Rotors Engine Spun Aluminum Instrument Panel Gauge Pack (Vacuum and Oil Pressure) High Performance Front Splitter K-Brace Large Radiator MagneRide Damping System with Track Inspired Calibration Strut Tower Brace TORSEN Differential with 3.73 Axle Ratio Unique Rear Spoiler Unique Track-inspired Chassis, Stability Control, EPAS, and ABS Tuning Unique Track-inspired Springs and Sway Bar Active Exhaust $995 Included Another incredible value option from Ford. The 4 settings, Quiet, Normal, Sport Plus and Track can either be pre-selected in the dash or automatically chosen with the Drive Mode Toggle. Plus, Active Exhaust has a Quiet Start Mode your neighbours will appreciate. Pre-Set a timer to always start in Quiet Mode. Turn heads in our 2019 Ford Mustang GT Fastback that's got plenty of swagger in Magnetic! Powered by a Coyote 5.0 Litre V8 offering 460hp while paired with a fun-to-drive 6 Speed Manual transmission with launch control as well as Electronic Line-Lock. Our GT is amazingly agile and responsive as it sprints to 60mph in just 4.7 seconds while scoring near 9.4L/100km. Enjoy a deep rumble that adds to the timeless good looks of our GT Fastback with its iconic curves that ignite a sense of adventure. Take note of the beautiful alloy wheels, raised blade decklid spoiler, LED fog lights, and HID headlamps with signature lighting. Open the door to this GT and settle into the low, sporty driver's seat. You'll enjoy a wealth of thoughtful features including a 50/50 split folding rear seat, aluminum-trimmed dashboard, chrome-accented 4-gauge instrument cluster, Intelligent Access with push-button start and even Track Apps performance telemetry! Maintain a seamless connection thanks to the Sync voice-controlled interface with a central screen, Bluetooth, and an impressive sound system with a CD player and dual USB ports. Not only does our Ford Mustang treat you to exceptional driving pleasure, it also provides priceless peace of mind. You'll be well-equipped with a rearview camera, advanced airbags, a tire pressure monitoring system, and MyKey parental controls. Rekindle your love of driving with this incredible machine! Print this page and call us Now... We Know You Will Enjoy Your Test Drive Towards Ownership! Blackstock is proud to be a premier Ford and Lincoln dealership in the Orangeville, Ontario area. From the moment you walk into our showroom, you'll know our commitment to customer service is second to none. Whether you need to purchase, finance, or service a new or pre-owned Ford or Lincoln, you've come to the right place. EXCLUSIVE BONUS ON ANY PP2 PURCHASED FROM BLACKSTOCK BUY A SET OF STREET TIRES (FOR YOUR PP2 STANG) UNDER OUR LOWEST TIRE PRICE GUARANTEE AND GET THE FOLLOWING FREE! 3 YEARS OF NO CHARGE REMOVAL & MOUNT AND BALANCE OF YOU TRACK OR STREET TIRES 2 TIMES PER YEAR! STATE OF THE ART EQUIPMENT AND 3M WEIGHT TAPE HUNTER DIGITAL BALANCING INCLUDED TWO LOCATIONS - BLACKSTOCK FORD OR QUICK LANE ORANGEVILLE Rare! Performance Pack Level 2 $6,500 Included! The Performance Pack Level 2 is not only the best performing Mustang GT ever, it offers unbeatable value. Incredibly, it also sells for the exact same $6500 in US dollars AND Canadian Dollars. Considering the Performance Pack 1 is $4,200 and Magneride is $2,500, then the PP2 including Magneride is clearly the way to go. Look at the value in detail: 19-inch x 10.5-inch (F) / 19-inch x 11-inch (R) Dark Tarnish Stainless-painted Aluminum Wheels 305/30/R19 Michelin Pilot Sport Cup 2 Tires (Summer Only) Brembo Six Piston Front Brake Calipers with Larger Rotors Engine Spun Aluminum Instrument Panel Gauge Pack (Vacuum and Oil Pressure) High Performance Front Splitter K-Brace Large Radiator MagneRide Damping System with Track Inspired Calibration Strut Tower Brace TORSEN Differential with 3.73 Axle Ratio Unique Rear Spoiler Unique Track-inspired Chassis, Stability Control, EPAS, and ABS Tuning Unique Track-inspired Springs and Sway Bar Active Exhaust $995 Included Another incredible value option from Ford. The 4 settings, Quiet, Normal, Sport Plus and Track can either be pre-selected in the dash or automatically chosen with the Drive Mode Toggle. Plus, Active Exhaust has a Quiet Start Mode your neighbours will appreciate. Pre-Set a timer to always start in Quiet Mode. Another incredible value option from Ford. The 4 settings, Quiet, Normal, Sport Plus and Track can either be pre-selected in the dash or automatically chosen with the Drive Mode Toggle. Plus, Active Exhaust has a Quiet Start Mode your neighbours will appreciate. Pre-Set a timer to always start in Quiet Mode. NOW INCLUDES OUR 2019 VENOM APPEARANCE PACKAGE FOR $3,469 - INCLUDES FUNCTIONAL FENDER VENTS, REAR FENDER SCOOPS, BLACKOUT WRAPPED ROOF, BLACKOUT WRAPPED LIP SPLITTER, BLACKOUT MUSTANG EMBLEMS, TIRE LETTERING & 3M WINDOW TINT! Turn heads in our 2019 Ford Mustang GT Fastback that's got plenty of swagger in Race Red! Powered by a Coyote 5.0 Litre V8 offering 460hp while paired with a fun-to-drive 6 Speed Manual transmission with launch control as well as Electronic Line-Lock. Our GT is amazingly agile and responsive as it sprints to 60mph in just 4.7 seconds while scoring near 9.4L/100km. Enjoy a deep rumble that adds to the timeless good looks of our GT Fastback with its iconic curves that ignite a sense of adventure. Take note of the beautiful alloy wheels, raised blade decklid spoiler, LED fog lights, and HID headlamps with signature lighting. Open the door to this GT and settle into the low, sporty driver's seat. You'll enjoy a wealth of thoughtful features including a 50/50 split folding rear seat, aluminum-trimmed dashboard, chrome-accented 4-gauge instrument cluster, Intelligent Access with push-button start and even Track Apps performance telemetry! Maintain a seamless connection thanks to the Sync voice-controlled interface with a central screen, Bluetooth, and an impressive sound system with a CD player and dual USB ports. Not only does our Ford Mustang treat you to exceptional driving pleasure, it also provides priceless peace of mind. You'll be well-equipped with a rearview camera, advanced airbags, a tire pressure monitoring system, and MyKey parental controls. Rekindle your love of driving with this incredible machine! Print this page and call us Now... We Know You Will Enjoy Your Test Drive Towards Ownership! Blackstock is proud to be a premier Ford and Lincoln dealership in the Orangeville, Ontario area. From the moment you walk into our showroom, you'll know our commitment to customer service is second to none. Whether you need to purchase, finance, or service a new or pre-owned Ford or Lincoln, you've come to the right place. Never underestimate the power with our 2019 Ford Mustang GT Premium Fastback that's got plenty of swagger in Race Red! Powered by a Coyote 5.0 Litre V8 offering 460hp while paired with a fun-to-drive 6 Speed Manual transmission with launch control as well as Electronic Line-Lock. Our GT is amazingly agile and responsive as it sprints to 60mph in just 4.7 seconds while scoring near 9.4L/100km. Enjoy a deep rumble that adds to the timeless good looks of our GT Fastback with its iconic curves that ignite a sense of adventure. Take note of the beautiful alloy wheels, raised blade decklid spoiler, LED fog lights, and HID headlamps with signature lighting. Open the door to this GT Premium and settle into the low, sporty, heated and cooled leather driver's seat. Enjoy a wealth of thoughtful features including ambient lighting, dual-zone automatic climate control, Intelligent Access with push-button start and even Track Apps performance telemetry! You'll love the Sync 3 infotainment system with voice control, touchscreen, Bluetooth, and an impressive sound system with available satellite radio, a CD player, and dual USB ports. Not only does our Ford Mustang treat you to exceptional driving pleasure, it also provides priceless peace of mind. You'll be well-equipped with a rearview camera, advanced airbags, a tire pressure monitoring system, and MyKey parental controls. Rekindle your love of driving with this incredible machine! Print this page and call us Now... We Know You Will Enjoy Your Test Drive Towards Ownership! Blackstock is proud to be a premier Ford and Lincoln dealership in the Orangeville, Ontario area. From the moment you walk into our showroom, you'll know our commitment to customer service is second to none. Whether you need to purchase, finance, or service a new or pre-owned Ford or Lincoln, you've come to the right place. Turn heads in our 2019 Ford Mustang GT Fastback that's got plenty of swagger in Shadow Black! Powered by a Coyote 5.0 Litre V8 offering 460hp while paired with a fun-to-drive 6 Speed Manual transmission with launch control as well as Electronic Line-Lock. Our GT is amazingly agile and responsive as it sprints to 60mph in just 4.7 seconds while scoring near 9.4L/100km. Enjoy a deep rumble that adds to the timeless good looks of our GT Fastback with its iconic curves that ignite a sense of adventure. Take note of the beautiful alloy wheels, raised blade decklid spoiler, LED fog lights, and HID headlamps with signature lighting. Open the door to this GT and settle into the low, sporty driver's seat. You'll enjoy a wealth of thoughtful features including a 50/50 split folding rear seat, aluminum-trimmed dashboard, chrome-accented 4-gauge instrument cluster, Intelligent Access with push-button start and even Track Apps performance telemetry! Maintain a seamless connection thanks to the Sync voice-controlled interface with a central screen, Bluetooth, and an impressive sound system with a CD player and dual USB ports. Not only does our Ford Mustang treat you to exceptional driving pleasure, it also provides priceless peace of mind. You'll be well-equipped with a rearview camera, advanced airbags, a tire pressure monitoring system, and MyKey parental controls. Rekindle your love of driving with this incredible machine! Print this page and call us Now... We Know You Will Enjoy Your Test Drive Towards Ownership! Blackstock is proud to be a premier Ford and Lincoln dealership in the Orangeville, Ontario area. From the moment you walk into our showroom, you'll know our commitment to customer service is second to none. Whether you need to purchase, finance, or service a new or pre-owned Ford or Lincoln, you've come to the right place. Turn heads in our 2019 Ford Mustang GT Fastback Premium that's got plenty of swagger in Shadow Black! Powered by a Coyote 5.0 Litre V8 offering 460hp while paired with a fun-to-drive 6 Speed Manual transmission with launch control as well as Electronic Line-Lock. Our GT is amazingly agile and responsive as it sprints to 60mph in just 4.7 seconds while scoring near 9.4L/100km. Enjoy a deep rumble that adds to the timeless good looks of our GT Fastback with its iconic curves that ignite a sense of adventure. Take note of the beautiful alloy wheels, raised blade decklid spoiler, LED fog lights, and HID headlamps with signature lighting. Open the door to this GT and settle into the low, sporty driver's seat. You'll enjoy a wealth of thoughtful features including a 50/50 split folding rear seat, aluminum-trimmed dashboard, chrome-accented 4-gauge instrument cluster, Intelligent Access with push-button start and even Track Apps performance telemetry! Maintain a seamless connection thanks to the Sync voice-controlled interface with a central screen, Bluetooth, and an impressive sound system with a CD player and dual USB ports. Not only does our Ford Mustang treat you to exceptional driving pleasure, it also provides priceless peace of mind. You'll be well-equipped with a rearview camera, advanced airbags, a tire pressure monitoring system, and MyKey parental controls. Rekindle your love of driving with this incredible machine! Print this page and call us Now... We Know You Will Enjoy Your Test Drive Towards Ownership! Blackstock is proud to be a premier Ford and Lincoln dealership in the Orangeville, Ontario area. From the moment you walk into our showroom, you'll know our commitment to customer service is second to none. Whether you need to purchase, finance, or service a new or pre-owned Ford or Lincoln, you've come to the right place. Never underestimate the power with our 2019 Ford Mustang GT Premium Fastback that's got plenty of swagger in Magnetic! Powered by a Coyote 5.0 Litre V8 offering 460hp while paired with a fun-to-drive 6 Speed Manual transmission with launch control as well as Electronic Line-Lock. Our GT is amazingly agile and responsive as it sprints to 60mph in just 4.7 seconds while scoring near 9.4L/100km. Enjoy a deep rumble that adds to the timeless good looks of our GT Fastback with its iconic curves that ignite a sense of adventure. Take note of the beautiful alloy wheels, raised blade decklid spoiler, LED fog lights, and HID headlamps with signature lighting. Open the door to this GT Premium and settle into the low, sporty, heated and cooled leather driver's seat. Enjoy a wealth of thoughtful features including ambient lighting, dual-zone automatic climate control, Intelligent Access with push-button start and even Track Apps performance telemetry! You'll love the Sync 3 infotainment system with voice control, touchscreen, Bluetooth, and an impressive sound system with available satellite radio, a CD player, and dual USB ports. Not only does our Ford Mustang treat you to exceptional driving pleasure, it also provides priceless peace of mind. You'll be well-equipped with a rearview camera, advanced airbags, a tire pressure monitoring system, and MyKey parental controls. Rekindle your love of driving with this incredible machine! Print this page and call us Now... We Know You Will Enjoy Your Test Drive Towards Ownership! Blackstock is proud to be a premier Ford and Lincoln dealership in the Orangeville, Ontario area. From the moment you walk into our showroom, you'll know our commitment to customer service is second to none. Whether you need to purchase, finance, or service a new or pre-owned Ford or Lincoln, you've come to the right place. Climb inside our 2019 Ford Mustang GT Premium Convertible that's got plenty of swagger in Magnetic! Powered by a Coyote 5.0 Litre V8 offering 460hp while paired with a fun-to-drive 6 Speed Manual transmission with launch control as well as Electronic Line-Lock. Our GT is amazingly agile and responsive as it sprints to 60mph in just 4.7 seconds while scoring near 9.4L/100km. Enjoy a deep rumble that adds to the timeless good looks of our GT Fastback with its iconic curves that ignite a sense of adventure. Take note of the beautiful alloy wheels, raised blade decklid spoiler, LED fog lights, and HID headlamps with signature lighting that adds to the timeless looks of our GT Premium Convertible! Open the door and settle into the low, sporty, heated and cooled leather seats and enjoy a wealth of thoughtful features including ambient lighting, dual-zone automatic climate control, Intelligent Access with push-button start and even Track Apps performance telemetry! You'll love the Sync 3 infotainment system with voice control, touchscreen, Bluetooth, and an impressive sound system with satellite radio, a CD player, and dual USB ports. Not only does our Ford Mustang treat you to exceptional driving pleasure, but it also provides priceless peace of mind. You'll be well-equipped with a rearview camera, advanced airbags, a tire pressure monitoring system, and MyKey parental controls. Rekindle your love of driving with this incredible machine! Print this page and call us Now... We Know You Will Enjoy Your Test Drive Towards Ownership! Blackstock is proud to be a premier Ford and Lincoln dealership in the Orangeville, Ontario area. From the moment you walk into our showroom, you'll know our commitment to customer service is second to none. Whether you need to purchase, finance, or service a new or pre-owned Ford or Lincoln, you've come to the right place. Climb inside our 2019 Ford Mustang GT Premium Convertible that's got plenty of swagger in Oxford White! Powered by a Coyote 5.0 Litre V8 offering 460hp while paired with a fun-to-drive 6 Speed Manual transmission with launch control as well as Electronic Line-Lock. Our GT is amazingly agile and responsive as it sprints to 60mph in just 4.7 seconds while scoring near 9.4L/100km. Enjoy a deep rumble that adds to the timeless good looks of our GT Fastback with its iconic curves that ignite a sense of adventure. Take note of the beautiful alloy wheels, raised blade decklid spoiler, LED fog lights, and HID headlamps with signature lighting that adds to the timeless looks of our GT Premium Convertible! Open the door and settle into the low, sporty, heated and cooled leather seats and enjoy a wealth of thoughtful features including ambient lighting, dual-zone automatic climate control, Intelligent Access with push-button start and even Track Apps performance telemetry! You'll love the Sync 3 infotainment system with voice control, touchscreen, Bluetooth, and an impressive sound system with satellite radio, a CD player, and dual USB ports. Not only does our Ford Mustang treat you to exceptional driving pleasure, but it also provides priceless peace of mind. You'll be well-equipped with a rearview camera, advanced airbags, a tire pressure monitoring system, and MyKey parental controls. Rekindle your love of driving with this incredible machine! Print this page and call us Now... We Know You Will Enjoy Your Test Drive Towards Ownership! Blackstock is proud to be a premier Ford and Lincoln dealership in the Orangeville, Ontario area. From the moment you walk into our showroom, you'll know our commitment to customer service is second to none. Whether you need to purchase, finance, or service a new or pre-owned Ford or Lincoln, you've come to the right place.